Authors are requested to submit a paper up to 3 pages in length, including title, author’s affiliation, abstract, figures, and references. During the initial paper submission, authors should clearly summarize the novelty of their contribution in a paragraph. The submission must be in electronic format (PDF). A Word template is available on the conference website. No hard copy submission will be accepted. Low-noise devices and circuits, high-power devices and circuits, wide band-gap devices, microwave tubes, control circuits (mixer, oscillator, switch, etc. ), MMICs, RFICs, millimeter and THz wave devices and circuits, graphene devices, and other relevant topics. Multiband, broadband, tunable, and reconfigurable filters, resonators, directional couplers and hybrids, waveguides and transmission lines, ferrite and SAW devices, RF MEMS, LTCC devices, packaging, metamaterials and EBG structures, plasmonic and optical components, nanomaterials, and other relevant topics. 5G systems, high-speed and broadband millimeter and THz wave systems, MIMO systems, microwave photonics, radar and sensor systems, IoT/M2M/RFID systems, wearable devices and systems, security and health monitoring systems, wireless power transfer systems, energy harvesting devices and systems, microwave medical and biomedical applications systems, whitespace systems, software defined/cognitive/smart radio systems, satellite systems, near/far field measurement, EMC/EMI, SI/PI, and other relevant topics. EM field theory, EM wave propagation, wave scattering and inverse scattering, DOA estimation, localization, antenna theory and design, millimeter-wave/THz and optical antennas, small antennas, broadband and multi-band antennas, MIMO antennas, active adaptive and smart antennas, reconfigurable antennas, body channel modelling, and other relevant topics. Nano-electromagnetics, artificial intelligence, machine learning and deep learning for wireless applications, electromagnetic-acoustics, and other relevant topics. 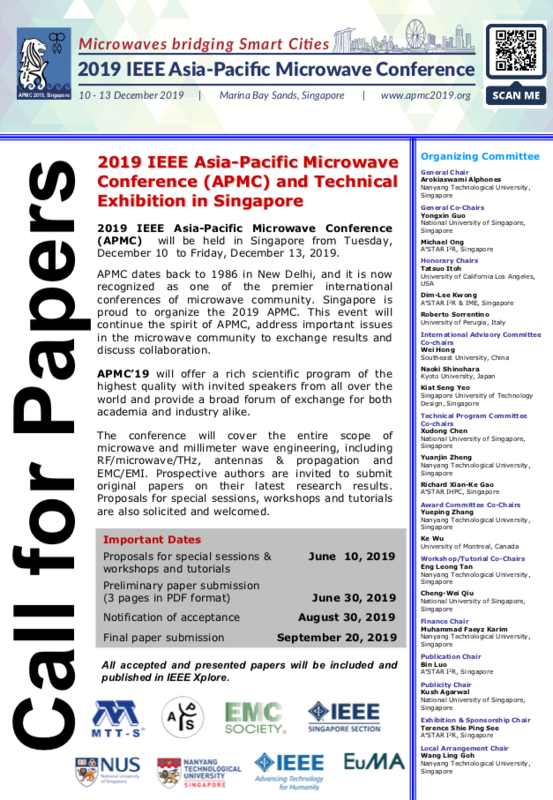 2019 IEEE Asia-Pacific Microwave Conference (APMC) prizes consist of Best Conference Paper and Best Student Paper Prizes. Students are encouraged to submit the papers provided that the student is the principal author and also the presenter. Please indicate in your electronic submission if you want to be considered for the Student Paper Prize. All accepted and presented papers will be included and published in IEEE Xplore.